Water is one of our most natural resources. It is an element that is essential to life and one that many of us long to be close to during the warmer months of the year. One way that many people choose to be close to the water is through boating. It has become a custom for a boat to have its own name and personality when it sets sail on the water. From larger vessels that can be seen around the sea coast to smaller vessels that are found on the numerous lakes across the country – the boat’s personality can usually be discovered in the name and vinyl graphics of the boat itself. 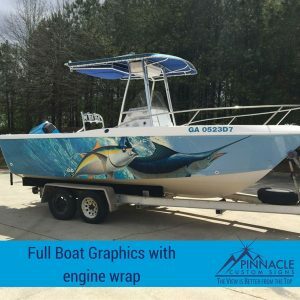 That is why around the beginning of every year, Pinnacle tends to serve the needs of clients who are enamored with the endless possibilities of what their boat can become through boat decals. Here are 4 things that boat owners should consider when deciding to invest in graphics for their boats. Most boat owners typically have a healthy respect for the water and the power of water during certain conditions. Anything that sits in water long enough can erode and deteriorate without proper care. This can be said about vinyl when it is applied to boats. When vinyl is misapplied, or the wrong vinyl is used on a boat, water can get underneath the vinyl and start to erode the adhesive. Not only can that create a problem with the boat numbers, name, or design staying on the boat – it can cause issues for the paint. 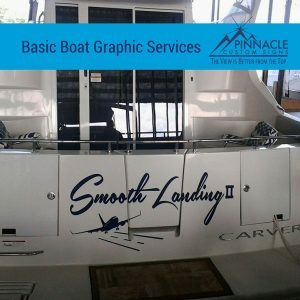 That is why it is extremely important to choose a company that uses the appropriate marine grade vinyl and correct application procedures when applying graphics to your boat. Some boats have been around long enough and endured enough sun exposure that they are simply ready to be refurbished or renovated. Many boat owners choose to do that through vinyl graphics because it is longer lasting and sometimes more feasible than doing a whole new paint job on the boat. By applying marine grade vinyl wraps to the entire boat, you can preserve the existing paint job and prevent future sun or water damage to the existing paint. Plus, it usually allows you to customize at a more economical price point. The additional benefit to using marine grade vinyl instead of a new paint job is that it provides an opportunity to personalize your boat beyond the boat’s name. From creating full murals to mixing color schemes, a custom boat wrap can cast any vision you desire. It also breathes new life back into that old boat and helps in feel new again. Vinyl can usually be applied to just about any part of your boat from boat sides to bow and even the engine cover to create a cohesive design. Single graphics, combo decals, partial and full wraps can be used to enhance your boats look. 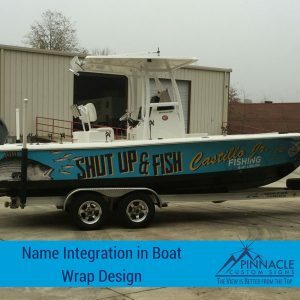 So, whether you just want to add a bit of flare to your boat name or decide you want to be the coolest looking pirate boat on the lake, you can make it happen with vinyl. To maximize the personalization, make sure to find an experienced company helps you to design the boat’s artwork around the waterline and boat elements to ensure that the details you love the most are the details that other’s can see as you pass by on the water. The last important point for boat owners to consider when deciding to invest in graphics for your boat is warranties. One thing that many boat owners don’t consider is asking an installer about their warranty process after the graphics are installed. Any trusted and certified vinyl installer is going to offer warranties through their company and through the vinyl material company that gives the owner a bit more protection. You will not get these same types of warranties and assurances when you buy vinyl boat lettering off the shelf or have someone install them who doesn’t have certifications. Warranties usually help a boat owner feel more at ease because it helps them to worry less about paint, resell, and longevity of their investment. Pinnacle Custom Signs is fortunate enough to be less than 10 minutes from Lake Lanier and less than 100 miles from 7 other large lakes in the Southeast. Our installation team has all the know-how and certifications to provide you with the assurances that your boat is wrapped correctly. 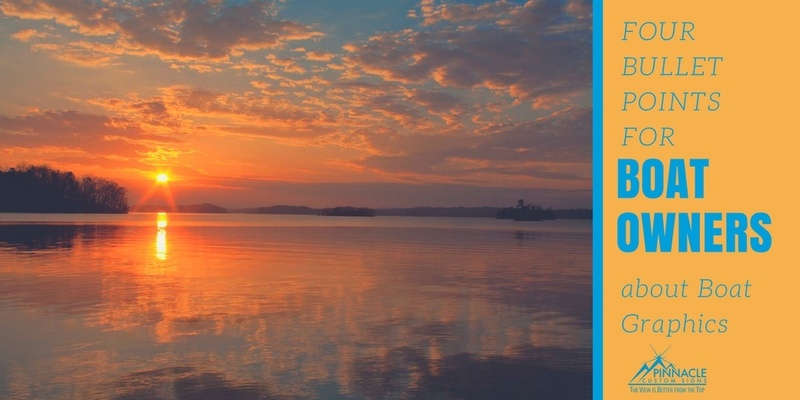 Our proximity to Lake Lanier allows us to meet many boat owners where they are at to add names and graphics. It also provides a quick delivery for boat owners that want to do a complete transformation of their boat’s appearance through wraps. Our team is always here to answer any questions you may have or provide you with a consultation. We would love the opportunity to work on your boat, but we also want to provide you with professional insight as well. Feel free to browse some of our previous boat work and give us a call!